Custom mountain lodge, on 35+ ac. usable horse property with 5 stalls, fenced. 2300 feet asphalt driveway, expansive home and 9 garage bays. 4 woodburning fireplaces throughout, 3 propane gas stoves. 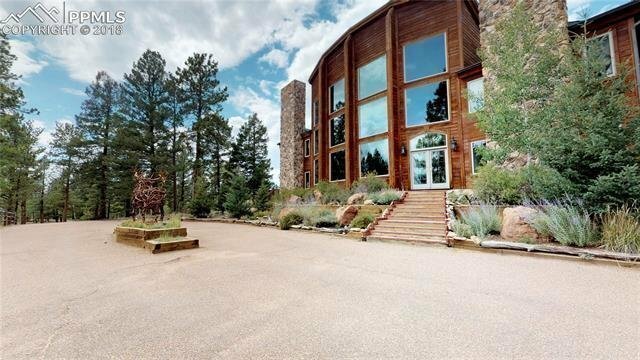 Great room includes 35 foot soaring pine tongue & groove ceilings, wall of windows with Pikes Peak views! Main level entertaining! Fir wood floors throughout, Bar room + den flanking either side on the LR. Large sunken rec room w/ walkout to landscaped backyard, formal dining room,gourmet kitchen + breakfast nook + chefs qrtrs Kitchen has stainless appliances, 2 refrigerators, 2 dishwashers, commercial DCS 6 burner stove/oven dual fuel, commercial vent hood and microwave oven, wine cellar is temperature controlled. Upper level overlooks the great room and Pikes Peak views. 4 upper level bedrooms, each guest suite w/ full baths + walk-in closets. Private Master suite has an office adjoining, w/ walk-out to upper deck, sitting and reading area next to a cozy fireplace, dual sided to the Jetted tub. Separate luxury bath, and large walk-in closet. Back yard sanctuary w/ 2 water feature ponds, extensive perennial gardens and irrigation system, surrounded by a 9 ft. fence. Entertaining deck at an incredible 1200 SF + outdoor wood-burning fireplace, built-in wood storage and cabinets for cushions! Property is served by an additional 7500 gallons of stored water from the domestic well, in line holding tanks, for a never ending H2O supply. Hot water In floor radiant heating, 9 zones, 2 domestic hot water heaters. New roof in 2017. Located in a private gated community, electric gated entry to the residence additionally. 2 car attached, + 3 car 1350 SF detached garage with upper level decked for additonal living space, gas and electric run + 4 car 1632 SF detached, overtop 5 stall barn.